This Chickpea Succotash is absolutely delicious and perfect over some fresh cooked quinoa. The mix of flavors between the lemongrass and the tomatoes make a great combination of flavors while keeping the dish light and fresh. Peel away tough outer layers. Crush inner white stems with rolling pin, then finely chop. Transfer to small bowl, and cover with ¼ cup boiling water. Set aside. Halve tomato through middle, and scoop seeds into strainer set over bowl. Press juice from seeds, then discard seeds. Set juice aside, and dice tomato flesh. Heat oil in large, deep skillet over medium-low heat. Add squash, ginger, and garlic, and sauté 3 minutes without browning. 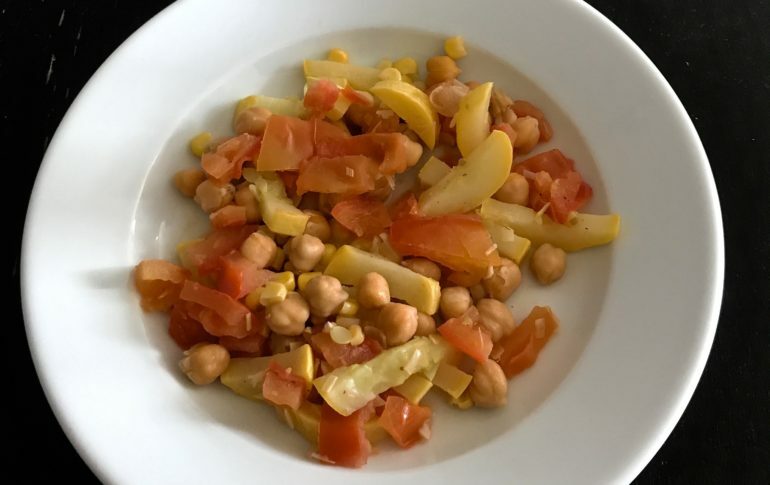 Stir in chickpeas, corn, diced tomato, lemongrass with liquid, and tomato juice, and season with salt and pepper. Cover, increase heat to medium, and simmer 5 minutes, or until tomatoes just begin to soften. Stir in basil.